Mohanthal is an Indian sweet. 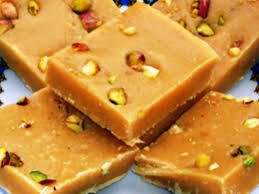 It is made from coarse besan, ghee, and sugar.it is also known as besan burfi. It is popular in Rajasthan and Gujarat, this sweet is part and parcel of the festival season. Combine the besan, three tbsp. of milk, and three tbsp. ghee in a bowl and mix it well using your fingertips till no lumps remain. Cover with lid and keep aside 30 minutes. Break lumps lightly with your fingertips and sieve it. Use sieve with big holes. Keep aside. Heat the ghee in an iron vessel on a high flame for a minute. Add the sieved besan mixture and cook on a medium flame for five minutes. Remove from the flame and keep aside to cool 15 minutes. Combine the sugar and one cup of water in a deep pan, mix well and cook on high flame, cook till the syrup is of 2 thread consistency. Add cardamom powder, saffron water mixture and the prepared sugar syrup mix well with besan and stir3to 4 minutes. Grease a thali (heavy base plate) with oil and pour the mixture into it, and spread it evenly using a flat spatula. Sprinkle pistachio and almond over it and pat lightly. Keep it aside to cool completely for1/2 to 1hour. Cut into equal sized pieces and serve it, or store in an airtight container.